Thousands of visitors need to park on campus during major athletic events. Transit and Parking has reduced the number of email notifications that individuals will receive concerning athletic events on campus. For many at the university, it will mean that there will be two email reminders for each event instead of four. Transit and Parking Director Gary Smith said they looked at the notification process and wanted to make a reasonable modification in the number of messages that are being sent. "We have heard from people on campus," he said, "that too many of these kind of emails were being sent. We have reduced the number of email messages in response to this feedback." 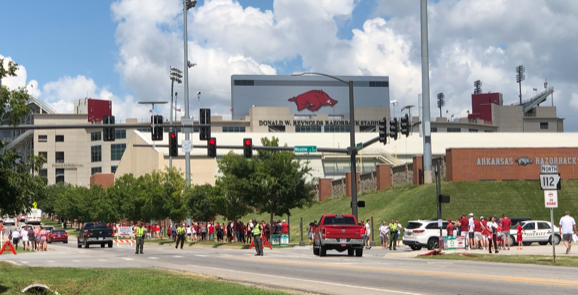 The department must communicate to motorists about vacating certain parking lots for football games, men's basketball games, and women's basketball games. To reach everyone who needed the information, emails were sent through both Listserv and ParkNet. ParkNet is the department's parking software. It enables Transit and Parking to know that a parking permit-holder did indeed receive the email. Listserv does not. Sending out fewer notifications means that virtually all parking permit-holders will get two reminders per event from ParkNet. Those who have signed up to get the additional notifications from Listserv will continue to get them. Individuals on campus who do not have a parking permit will not be getting the game notifications, but may choose to receive them by going to parking.uark.edu/parking-services. Parking permit holders will receive an email notification on the day before an athletic event and on the day of the event. They will not get the emails from Listserv unless they have requested them. As a standard practice Transit and Parking has sent several email reminders because there are always large numbers of vehicles that are cited or towed before each football or basketball game. Transit and Parking Communications Director David Wilson said the new procedure of sending out fewer emails will be evaluated for the next several months to see how things go. "We use both email and social media to let everyone know which lots must be vacated before games," he said. "For most students and employees this will mean that the number of emails about athletic events will be cut in half." The Lady Razorbacks have a home game on Wednesday evening. The men's Razorback basketball team has upcoming home games on Dec. 1, 8, 19, 22, and 28. "Our intention," Wilson said, "is to send out as few emails as possible, but still inform the campus so that we have to cite or tow as few vehicles as possible."